Navy Tuiasosopo was a starting center for the Los Angeles Rams during the 1987 players strike. he played his college football at Utah State. 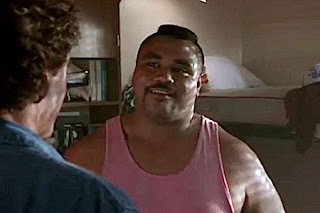 Tuiasosopo's role was Manumana "the Slender" in the 1991 film Necessary Roughness. He starred as E. Honda in Street Fighter. He's also played lots of security guards and other "heavys" in his recent roles. Manu tells the team to "Have some respect" as he allows Ireland to shower in privacy. At 1:04 Manu makes a key block and takes out the nemesis of Texas State University Fightin' Armadillos: Harlan 'Flat-top' Meyers of the University of Texas Colts.